I have been reading “The Knitting Answer Book” by Margaret Radcliffe, which Jolene gave me a while ago, and have found it to be an absolute gem. This book is filled with snippets of information which are not easily available on the web. Personally, I have not searched the web for yarn structure. I don’t think I ever would have! But after learning it, I realise now that this knowledge is useful when I’m selecting the right yarn for my knitting project. The most common thing I’ve googled for is specific techniques I need for my current projects. “The Knitting Answer Book” covers that too, with clear diagrams and concise descriptions. Like many others who have raved on about this book, I have included it in my knitting bag. 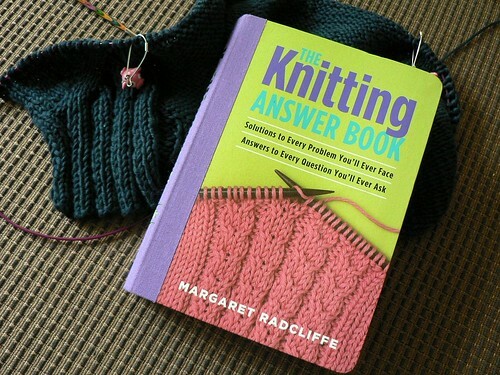 “The Knitting Answer Book” is an indispensable knitter’s tool. not to beat you over the head again with “you should learn to spin” but you do get to learn a lot of that yarn structure stuff in spinning-land (books, magazines, practice). Even if “one” 😉 only spins a few times, it really does teach you a lot about yarns and why they behave/wear/appear the ways they do! I would love to learn to spin! Ok. Next Monday. Your place. Teach me, oh wise one. But be prepared to be photographed and blogged about. 🙂 Thanks Hope! Hi! I also have this book and find it very useful too. I still haven’t looked at it in all the details, but it a really good one. Maryse’s last blog post..1 of 2! I agree! I find it so much easier than having to look on the web for help all the time. Enjoy the rest of your weekend, Maryse!